When considering ways of preventing a near-earth object (NEO) from striking the Earth, it’s all to easy to suggest that we blow it out of the sky with nukes or other powerful weapons. However, this is not the most elegant or safest of solutions, primarily for the reason that a plethora of much smaller NEO’s are created in the process, arguably creating a whole slew of new threats. Rather, it’s been thought that the key to managing threatening NEO’s, such as asteroid Apophis (which has a disturbingly close chance of hitting us in 2036), is to simply brush them aside and change their trajectory. 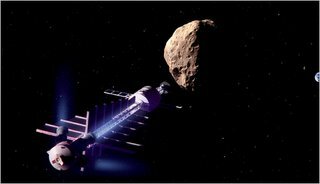 Along these lines, a pair of NASA astronauts, Edward Lu and Stanley Love, have proposed that a 65-foot-long space “tractor” be deployed to hover above an asteroid and use its gravitational force to “tug” the NEO out of harm’s way. Their plan calls for the spacecraft, what they call the “gravitational tractor,” to hover near the asteroid for a period of several months or years. The small gravitational force exerted on the asteroid by the vehicle would be enough to move the NEO into a slightly different orbit. Astonisingly, the force required could be as little as a quarter of a pound. Now we just need to make sure we do it. I can just see us around the year 2032 thinking, jeez, maybe we should’ve done something about this a couple of years ago….